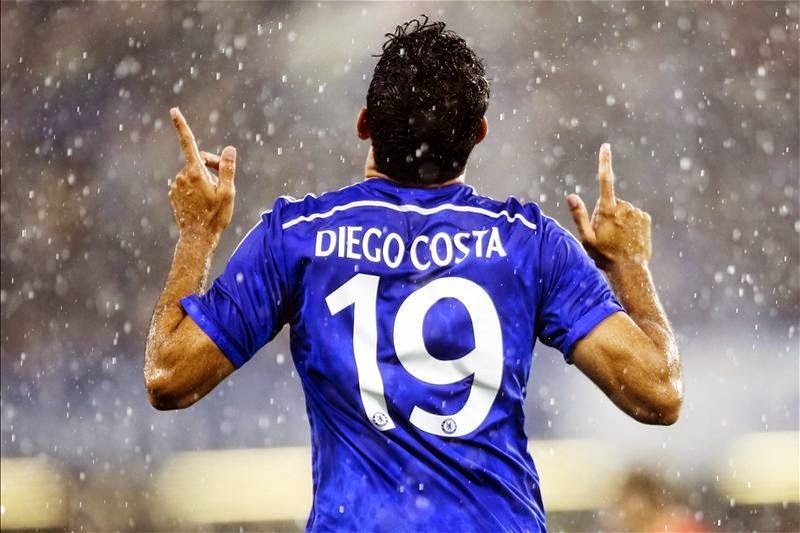 DIEGO COSTA: WHAT A PRE SEASON - WHAT A STRIKER!! Talk about hit the ground running! What more could you say about Diego Costa's start to life at Chelsea? Chelsea were crying out for a striker who literally had it all and could stick the ball in the back of the net. Chelsea have found him! Chelsea fans are only too aware of the pitfalls of what life could be like as a Chelsea striker. You hope that they fit in first of all, settle down, get used to playing in the team and to then score goals. Diego Costa plays as if he has been here for years. It's everything about him and his game that has impressed me. He works hard off the ball, always making runs and offering himself to whoever has the ball either in behind, in between defenders or short to make an option for an easy pass. You look at him and he doesn't seem to be quick or at least give you the impression that he is, however he has demonstrated time and time again just how quick he can be when he opens his legs up and makes that surging run off the ball. When he comes deep and offers himself as an option short, he holds the ball up and is strong enough to shield the ball, hold off the challenge of his opponent and maintain possession of the ball to lay a pass off to one of his team mates. Now, the difference between Diego Costa and Fernando Torres at the moment apart from a belief in his game and confidence is the fact that he is clinical and doesn't hesitate. He plays with such an instinct in and around the box that he knows that if he is given the service, more often than not, he will score or make the Goalkeeper work at least. The added bonus to Costa is his willingness to play someone else in who is in a better position than he is to score rather than take his chances. People forget that in pre season Costa has made three important assists. Costa has scored four pre season goals and every single one of them is different. Each goal he scored over these past few weeks has given us a glimpse of just what he is capable of. His second goal of pre season is by far the best of the bunch and offers all of us an insight into the technical ability he has. We all know about his strength and the fact he can finish but you really, really need to see this one! Now to last night and Diego Costa's third goal of pre season. We have seen Costa make a run from deep in between two defenders, played in by Fabregas. This time we are in and around the box. Having seen Chelsea win possession high up the pitch and Ramires with the ball just outside the box, Costa makes a run beyond the defence, reliant on the perfect pass and Ramires gives him exactly what he wants. Costa, without a second thought or hesitation, runs onto the ball, beating his defender and finishes clinically into the bottom corner. His fourth and final goal of pre season is all about being in the right place at the right time. Andre Schurrle curls a great effort with his right foot towards goal. With the Goalkeeper beaten, the ball hits the post and comes back out to Costa and once again, without hesitation, he reacts and scores first time into the empty net. Diego Costa couldn't have dreamt of a better start to life at Chelsea and especially tonight, taking just 57 seconds to score his first goal at Stamford Bridge! To think that last season Chelsea finished with 84 points WITHOUT a prolific goalscorer! Just imagine what we can achieve with Diego Costa this season! What a pre season! What a striker!